This is an inverted pose. The back of the head, neck, shoulders and upper arms are on the floor. The torso is perpendicular to the floor with the hips over the shoulders. The legs are overhead and spread wide apart. The arms stretched to hold the toes. 1. 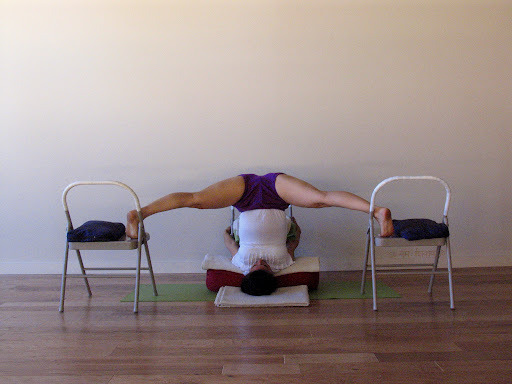 From Halasana or Karnapidasana stretch the legs straight and spread the legs as far apart as you can. 2. Pull the trunk up and extend the backs of the knees. 3. Hold the right toe with the right hand and the left toe with the left hand. 4. Keep the heels up. 5. Move the posterior spine up. Press into the heels to extend the hamstrings. For heaviness in the abdomen or chest, place the feet on two chairs or a bench.